MICKEY. Rescued after a three-year wait from a shelter in Long Island. Dog-proof your home: Place all harmful chemicals and dangerous or fragile objects out of the reach of your new dog. Sav-a-Bull will also provide you with a crate, a fitted collar and leash, and toys that are safe. Consider your dog's feelings: Remember how nervous you felt on the first day of school? Well that's how your dog feels on his first day in your home. Try not to overwhelm him with too much attention. He may express his nervousness by panting, pacing, or in some cases hiding. Give him a chance to settle in, and make sure he has access to a quiet place where he can go if he wants to be by himself. Keep in mind that dogs have personalities as varied as those of people: When introducing your new dog to people be sure to do it gradually. Wait a few days and limit new introductions to one or two people at a time. 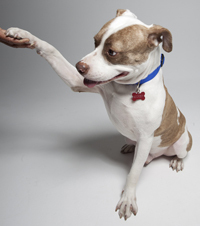 Be sure that your dog is leashed during introductions. Give him a chance to shine: Your dog that has been taught basic rules, to help him become a well-adjusted and well behaved. Check out what he learned and how with Train-a-Bull: basic obedience training and other helpful training tips. In addition to maintaining this behavior, always make sure he receives an appropriate amount of exercise every day. Get your dog into a daily routine: Pick times for feeding, sleeping and exercising and try to stick to that schedule. The sooner you establish this, the sooner he will adjust to your home. And please be patient with your new dog, he may take a few weeks to feel as safe in your home as you do.